A ClotCare editorial board member (Dr. Lyons) pointed out that the accompanying editorial needs to be considered in order to fully understand the value and limitations of the findings of this study. Also, a ClotCare visitor pointed out that this trial did not address the efficacy and safety of long-term combination antiplatelet therapy in patients who are aspirin failures and/or aspirin resistant. The editorial makes at least three very important points. First, prior data clearly demonstrate that short-term combination antiplatelet therapy is superior to aspirin alone when used for conditions of acute vascular injury (such as with acute coronary syndrome and/or coronary artery stent placement). Second, that combination antiplatelet therapy does carry an increased bleeding risk so much so that in the recent ACTIVE trial the combination of clopidogrel plus aspirin in patients with atrial fibrillation was associated with a bleeding rate that was comparable or somewhat higher than the bleeding rate with warfarin therapy. The third issue (which is very important in interpreting and applying the CHARISMA trial data) is that one should be very reluctant to use findings of the sub-group analysis ("symptomatic" vs. "asymptomatic") for anything other than generating other hypotheses to be tested. Clearly, the overall study (which was quite large and extended for slightly more than 2 years) failed to show benefit of long-term combined antiplatelet therapy in the population studied; but did show a significant increase in severe and major bleeding. That conclusion (lack of benefit and increased bleeding risk) seems clear and well-founded. Other conclusions based on sub-group analysis should not be considered valid until confirmed (or refuted) in appropriately designed studies. As pointed out to ClotCare by one of its readers, the negative results of this study can not be extrapolated to patients who have failed and/or are resistant to a single antiplatelet agent. Certainly one could hypothesize that combining antiplatelet agents (or changing to the alternative antiplatelet agent) might be beneficial in high risk patients who fail single antiplatelet therapy or who are found to be resistant to one of these agents. Similarly, if one is resistant to a given antiplatelet agent, then that patient might have a lower risk of bleeding with combined therapy. What may - or may not - happen with long-term combination antiplatelet therapy in a population that was not studied may seem at first to be useless speculation. However, it is entirely plausible that high risk patients might have responded differently in this trial if the trial had been conducted in those who have failed one antiplatelet agent and/or who are resistant to a given antiplatelet. It would seem that both the CHRISMA editorial and the comments of the ClotCare reader have a common thread - we should keep in mind the patient type or group(s) for whom the study was designed and (1) resist the temptation to accept conclusions of sub-group analysis and (2) be careful not to apply the valid findings of a study to a population (or sub-population) that was not specifically studied and might well respond differently. Bhatt DL, Fox KAA, Hacke W, et al. Clopidogrel and aspirin versus aspirin alone for the prevention of atherothrombotic events. N Engl J Med 2006; DOI:10.1056/NEJMoa060989. Available at: http://www.nejm.org. American Heart Association. Updated American Heart Association Statement: Patient guidance based on results of the CHARISMA trial. March 16, 2006. http://www.americanheart.org/presenter.jhtml?identifier=3038359. Pfeffer MA and Jarcho JA. The charisma of subgroups an dthe subgroups of CHARISMA. N Engl J Med. 2006; DOI:10:1056/NEJMe068057. Available at: http://www.nejm.org. 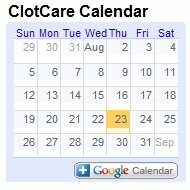 *Dr. Moore is a guest editor for ClotCare. Dr. Moore is a primary care clinical specialist with the South Texas Veterans Health Care System in San Antonio, TX.